Stansted Airport is part of M.A.G and started working with youth charity The Prince’s Trust in 2013. 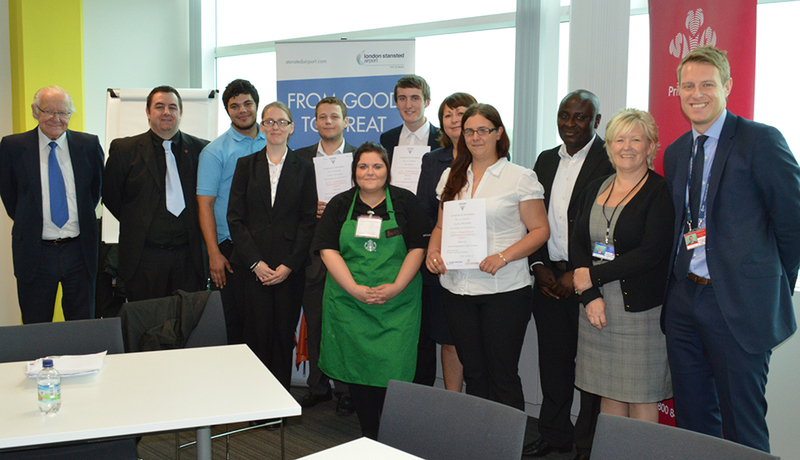 Through the charity’s Get into Airports programme, Stansted Airport has run one course which helped nine young people move into work, education or training. Two of the young people who secured jobs are now working at the airport at Starbucks and the Holiday Inn.The four-week Get into Airports programme for 16-25 year-olds, gives young people hands-on experience in the aviation industry, as well as developing their confidence and motivation. As part of the programme the young people gained an EDI Level 1 Preparation for Employment qualification and accredited training in Food Hygiene, Manual Handling and First Aid at Work.Stansted Airport is aware of the impact a skills shortages would have upon the industry and its business. By working with The Prince’s Trust – the UK’s leading youth charity – it is not only helping to tackle youth unemployment, it is up-skilling its next generation of workers while spreading the word about the benefits of building a career in aviation. “Thanks to the partnership, we have gained access to young people who want to find out more about what we do and the skills they need to make it happen. By giving young people the skills to find work we are helping to drive the economy by tackling youth unemployment.